As we get ready for Dexter‘s final season on TV (premiering June 30th on Showtime), I thought it would be fun to take a look at the differences between the show and the books (authored by Jeff Lindsay). Last week, you may recall, I did the same for Rizzoli & Isles. This is going to be a little bit different because in this case I have a much more definite opinion about which format works better. For those of you unfamiliar with the premise, the titular Dexter Morgan is a blood spatter analyst for the Miami Homicide Unit hiding a whopper of a secret. You see, Dexter is a serial killer in his off hours, albeit one with a strict moral code instilled in him by his policeman father. Unable to control his homicidal urges, Dexter channels them for the greater good by tracking down people who literally got away with murder–the criminals who, for one reason or another, got through the cracks in our justice system–and exacting his own form of bloody justice upon them. Needless to say, there are spoilers ahead for the uninitiated. Where do I start? The first half of the first season stuck pretty closely to the first book in the series, then began to diverge. By the second season it was very clear that the TV show and the books were on separate paths, and neither format has ever looked back. The characters aren’t even the same. LaGuerta was killed off at the end of the first book, for example, but she remained a thorn in Dexter’s side until the shocking final moments of the seventh season (although, oddly enough, the circumstances of her offing were somewhat similar). Doakes, Dexter’s main adversary on the police force, was killed off in TV’s second season and blamed for all of Dexter’s crimes up to that point, but he’s still a menace in the books–even without a tongue or several limbs (lost to a sadistic serial killer along the way). Dexter’s wife, Rita, was famously killed off at the close of the fourth season, but on the page she lives on (as of this post’s publish date, at least), clueless as ever. I could really go on. And on. Suffice to say, most of the characters in the TV show never even exist in the books, and vice versa. The plots diverge even further when it comes to Dexter’s Dark Passenger (his nickname for the urge that drives him to kill). The TV show takes a significantly more realistic route here, never really attempting to explain where the urges come from beyond the fact that he saw his mother brutally murdered as a toddler and was never the same after. Now the Dark Passenger is too much a part of who he is to ever be denied. Jeff Lindsay, meanwhile, decided to explore (and explain) the Dark Passenger in his third book, Dexter in the Dark. Turns out, his Dexter has been possessed by an ancient spirit that moves from host to host, causing chaos through the ages. No, seriously. But I’ll discuss that further when I get to the book reviews in another post. On TV, Dexter emphasizes the dramatic elements of the story. It benefits greatly from some clever acting, which adds depth to characters that are one-dimensional on the page. As the seasons progress that depth pays off because it gives them direction in addition to dimension. It’s the opposite of what I discussed with Rizzoli & Isles last week: in this case, TV is where the story thrives and the characters find themselves on journeys that force them to progress. Perhaps Dexter himself is the best case-in-point of this phenomenon. Lindsay’s Dexter remains the emotionless, socially clueless sociopath he was at the beginning. 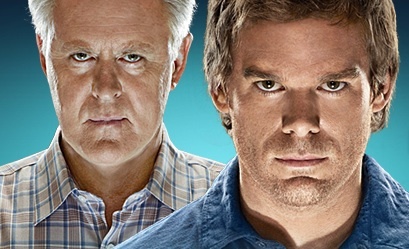 Michael C. Hall’s Dexter starts out that way but finds himself shaken at the end of the first season, when he is forced to kill his newly discovered biological brother–who understands and, more importantly, accepts him–to save his adopted sister, Debra, who remains in the dark about her brother’s twisted hobby. This loss stays with him, haunts him. In the third season, driven by a need to be accepted and to rediscover the brotherly bond he lost, Dexter attempts to forge a partnership with Miguel Prado (played by Jimmy Smits), an ADA driven to the brink by his own brother’s death. Needless to say, it doesn’t go well. But something has happened: Dexter’s neediness for acceptance has festered into something that alternately repels and fascinates him. The idea of a normal life is oddly appealing to Dexter even as he rejects it as an impossibility. No small coincidence that at this same point Rita becomes pregnant and Dexter must ready himself to become a father. There we come to the apex of the Dexter TV show: the fourth season, where Dexter discovers John Lithgow’s spectacularly creepy Arthur Mitchell: a seemingly perfect family man who moonlights as the brutal Trinity killer Miami homicide is attempting to track down. Having failed to control his deadly urges for the sake of his new son, Dexter is fascinated by the prospect that it might be possible to have it all: a perfect family life, a deadly hobby, and an uncanny ability to remain hidden (Trinity has been an active serial killer for decades by the time Dexter finds him). Unable to stay away, he gets close to Arthur Mitchell under a false name, enticed by all the promise his life holds. And that’s where things start to go terribly wrong for Dexter, as the Mitchell family begins to crack apart, Miami homicide begins to zero in on Arthur, and Arthur discovers Dexter’s true identity. Dexter emerges triumphant from their final confrontation (naturally), only to discover that Trinity left one last victim in his wake: Rita, lying dead in the bathtub with their son crying on the floor, covered in his mother’s blood in a shocking, gut-wrenching scene reminiscent of the one that made Dexter who he is today. Naysayers will tell you that the show has gone downhill since that moment. I don’t necessarily believe that. Yes, the fourth season was hands-down the show’s best. However, I would argue that the seasons that came after are comparable to the first three in terms of quality (with a few quibbles). The show isn’t without it’s problems, though. Especially in these recent seasons. Dexter is supposed to go after the criminals who slip through the cracks–the ones that got away or remained unnoticed. He’s always played a little fast and loose with that aspect of Harry’s Code on the TV show (in season 3, for example, he very narrowly escapes being caught with the serial killer they have been hunting all season). But after season four it started to get strained. Instead of looking for people who got away with it, Dexter starts actively trolling current cases for potential victims. Cases the homicide team is currently investigating. I know, it creates much more tension to have Dexter literally at odds with the police force he ostensibly works for, but the more it happens the less credible it seems. You could argue that TV’s Dex is suffering from a nasty case of risk addiction, but I’d argue the culprit is more likely to be contrived plot addiction from the writers. There’s also a disappointing amount of wheel-spinning in these later seasons. 24 suffered from the same syndrome: throw a bunch of crap at the wall to get things moving, then if something isn’t working just kill characters until that plotpoint goes away. Seasons 1-4 excelled at coming up with a plot that would run its course the whole season. Now, seasons six and seven featured hyped appearances by Mos Def and Ray Stevenson that didn’t even make it past the halfway point of their seasons. ** Season six also introduced a creepy intern named Louis Green, a computer expert who has a curious obsession with the Ice Truck Killer and who inserts himself into Dexter’s life by dating his babysitter as the show headed into the season finale (and no, it did not look like he had good intentions). What was his game? Why was he so intent on getting into Dexter’s life? Creepiness abounded, setting up a big storyline for the next season … except Louis was killed off three episodes into season seven after revealing that he was just a spoiled rich kid who was mad at Dex for thinking his video game idea was lame. Seriously. Dexter had zero trouble humiliating Louis and getting rid of him. After all that promise, he wasn’t even a threat. Dex didn’t even have to finish him off (a chance encounter with Stevenson’s Isaak Sirko took care of that). Why did they even bother with all the set-up if they clearly didn’t feel invested enough in the idea to pursue it? Also: Joey Quinn is an incredibly annoying character. How many times does he have to screw up (in methods ranging from substance abuse to sleeping with a key witness at least once per season) before he gets kicked off the squad for good? Or killed because of his own stupidity? Seriously, he outlived his usefulness to the plot (not to mention whatever interest his character had) a long time ago. Even so, I am very excited for the final season. I’ll do a full wrap-up in a separate post (read it here), so I’ll just hit some big differences or running themes for now. This is going to sound mean, but to a large degree the books suffer from a degree of sameness. Dexter is haplessly targeted by a psycho who’s own Dark Passenger recognizes his, eventually resulting in the kidnapping and endangerment of Rita’s kids Astor and Cody. Jeff Lindsay, I adore your seriously effed-up imagination, but if Astor and Cody get nabbed by the bad guy in Dexter’s Final Cut this August I may throw a book across the room in frustration for only the second time in history. The supporting characters of Debra and Rita are much more rote and one-dimensional on the page; it’s incredible how Jennifer Carpenter and Julie Benz, respectively, managed to bring those characters to life and give them depths Lindsay never seemed to dream of. Benz’s dialogue as Rita featured the same halting, scattered style, but she somehow managed to make it work without being annoying. Her Rita was lovable. In the books her children from a previous, bad marriage, Astor and Cody, display Dark Passengers of their own that Dexter must train (on TV, they’re normal kids). Lindsay’s Rita doesn’t see the truth about her husband and children because, well, she’s a dithering fool. Benz’s Rita is a damaged woman reeling from an abusive relationship. She doesn’t see Dexter’s true nature because she’s too blinded by her own faith in him. It’s easy to see why TV Dexter eventually realizes that he cares for her, whereas book Dexter remains utterly emotionless about the wife he uses for cover so he won’t seem like a loner. Carpenter’s Debra is still a tough-as-nails tomboy whose vocabulary could make a hardened sailor blush, but on screen there’s a fragility underlying it all that makes her much more interesting. Lindsay’s Debra knows her brother’s secret after the first book but doesn’t do much about it. She finally has an existential crisis about her serial killer brother in Dexter By Design (the fourth book in the series! ), but it gets resolved when Debra is stabbed in the course of an investigation and left in critical condition. Lying in the hospital, she urges Dex to kill the person who did this to her. So, essentially, she gets around her moral quandary because she needs Dexter to exact revenge for her. Carpenter’s Debra isn’t so easy. When she finds out his true nature, she is initially duped by Dex into believing that he’s innocent (or more innocent than it looked). Once she realizes how deep his urges go she tries to force him to reject them by refusing to let him out of her sight. Real effort goes into fixing her brother. She finally, reluctantly, admits to seeing the silver lining of Dexter’s moral code–but only after her precious judicial system set a killer loose and she found herself powerless to stop him. It makes a lot more sense in the TV show, especially because they heighten the precarious nature of their alliance. Debra is culpable now that she’s helping Dexter hide. She even has LaGuerta’s blood on her hands now. They’ve both put a great deal at stake to preserve their familial bond. Punishment, if and when it comes, will be merciless. Have I made it obvious that I prefer the TV show? I do. I still read the books, but almost guiltily. It really is the reverse of Rizzoli & Isles: here, the books are goofier and static while the TV show is gritty, more dangerous–with characters who evolve over time. The TV series also has higher stakes. 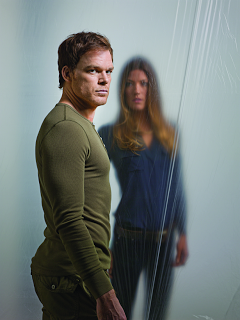 There’s a greater sense of urgency that there will be consequences for Dexter–and Debra, too. TV’s Dexter is also a great deal more complex. He starts out the same emotionless drone as in the book, but he grows. He grapples with big questions of life, morality, death, truth, consequences, family, and even religion during the course of the series. He saves Debra at the expense of his biological brother in season one, and the choice genuinely haunts him over time. He grows to love–first Rita, then his son Harrison, Debra, and perhaps season five’s Lumen and season seven’s Hannah (who will return in season eight, though it remains to be seen if she’ll be a love interest or an antagonist). Michael C. Hall deserves all the credit in the world for making this complex, disturbing character feel like someone you hate to root for. How will it all end? Stay tuned. For more Dexter, check out my first Dexter Rundown, where I review the first two books in the series. They’re bloody good. Then take a look at Part 2. * In the books not only does Dexter’s brother survive, but Debra finds out the truth about Dexter right there. ** C’mon, guys. Ray Stevenson deserved better than a revenge plot that went nowhere. Also, the concept of a gay Russian mobster staying closeted to stay alive was so much more interesting than the execution you gave it.